A celebration of lilacs takes place every June on Mackinac Island where this Northern Michigan destination features many varieties of gorgeous lilacs in a 10-day festival. With dozens of varieties, some brought to the island before the Civil War, the lilacs are the stars of this spectacular celebration. 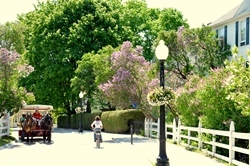 Don't miss the Mackinac Island Lilac Festival with 10 days of activities in a spectacular setting. 2:30pm Special Tour, Fort Mackinac. Admission: $13.50, children: $7.75. 11:30am–1:30pm Taste of Mackinac, Mackinac Island Community Center. Tickets may be purchased online only. To purchase tickets for this event, click here. 5:30pm Parade Winners and Raffle Party. Parade Winners. First Place is $5,000, Second Place is: $3,000, Third Place is $2,000. Drawing is at 6:30pm. Raffle tickets are: $100.